The words Made in Switzerland can almost double the price of a luxury watch. For hundreds of years Switzerland has been regarded as the pinnacle of watchmaking expertise and watch aficionados around the world have been ready and willing to pay significantly more for a timepiece manufactured in Switzerland. All that may be changing, since current Swiss laws governing what constitutes a Swiss watch are ambiguous at best. Currently, only 50% of the value of a watch’s movement must be made in Switzerland in order to display the very desirable words “Swiss made” on the dial. This means that less critical watch components such as cases, straps and dials can be manufactured anywhere. It has been common practice for decades for many mid-sized Swiss watchmakers to buy these components in Asia, primarily in China. With a strong Swiss franc and much higher labor costs, only a few top luxury brands can afford to manufacture all of their components in Switzerland. 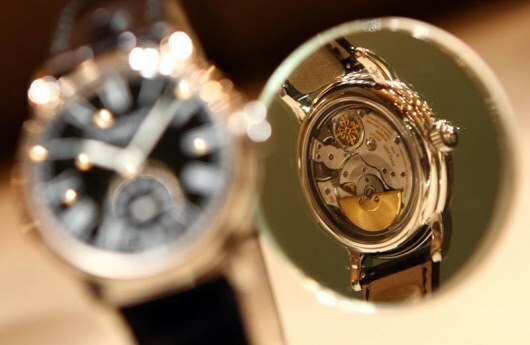 Many Swiss watchmakers say that current weak Swiss laws make it possible for watches produced almost entirely in China to be sold legally under the “Swiss made” label. These manufacturers want to replace current 40-year-old directive, which says at least 50% of the value of the watch movement must be made in Switzerland, with a new law that increases the percentage of Swiss made watch components to 60%. According to Jean-Daniel Pasche, chairman of the Swiss Watch Federation, the current weak law harms Swiss brands as customers learn their timepieces are not entirely Swiss. “Some people already complain their Swiss watches are not as Swiss as they should be,” says Pasche. Not all Swiss watch manufacturers agree. Ronnie Bernheim, head of the popular Mondaine brand, says a 60% threshold could compel makers of lower-priced Swiss made watches like Mondaine to buy cheaper components abroad. The controversy continues to rage, with watchmakers like Mondaine on one side of the issue and others like 260-year old Vacheron Constantin on the other side. While some well-known Swiss brands like TAG Heuer now openly admit buying movement parts from Seiko in Japan, the powerful Swiss Watch Federation has become so upset about lax support for higher standards that they recently resigned from the Swiss Business Federation. “By failing to support a 60% minimum rate of Swiss value in a Swiss product, The Swiss Business Federation not only stands in the way of strengthening the protection of the Swiss made label, it also raises the likelihood of it becoming weaker than it is at present,” says a Swiss Watch Federation spokesperson. Nobody knows where this controversy will end, since there are many different economic interests involved. Mondaine’s Ronnie Bernheim fears that stricter regulations will threaten his business and force him to cut jobs. Julien Marchenoir, brand equity director at Vacheron Constantin says a strong Swiss made label will help keep watchmaking know how in Switzerland. TAG Heuer, on the other hands, doesn’t think using Seiko parts will hurt its Swiss made image at all. According to the Reuters News Agency, the Swiss parliament is now debating two measures about how to define a Made in Switzerland product. The lower house has argued that 60% of the value must be manufactured in Switzerland for it to bear the “Swiss made” label, while the upper house thinks that 50% is enough. However before this issue is resolved, it’s safe to say that your next watch will probably have at least a few components made in Asia.